These squirrels are the most common and identified type when we think of a squirrel. Gray squirrels forage and play in our back yards, feed off our bird feeders, and often nest in near by trees during the warmer months of the year. Being in great abundance and adapting so close to our living space makes them widely known and easily identifiable. Gray squirrels are bushy tailed rodents with a mixture of brown, black, and white fur which when viewed from a distance blend together to look gray. Their belly fur is white or light gray. Some gray squirrels are black, a color phase that has become more prevalent in Massachusetts and New Hampshire. Their bodies are approximately 16-20 inches long and they can weigh up to 1.5 pounds. *Gray squirrels can cause significant structural damage and potentially dangerous situations by gnawing at wood and electrical wires. 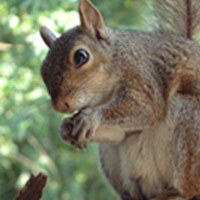 to learn about our squirrel removal services click here. What do red squirrels look like? The red squirrel is a small squirrel with reddish to reddish-gray fur on top and a white or cream underside. It has white around its eyes. Its tail is not as long or bushy as the tail of other tree squirrels. In the summer, the red squirrel may have a black stripe on its sides. Its curved front claws and powerful hind legs make it a very good climber and jumper. These squirrels are not as common as the above mentioned but can be just as aggressive when trying to enter a home. We have seen reds that enter at foundations of a home as well as at rooflines. They are most commonly found in northeast MA and in the state of NH but service calls for such animals have been received in south shore MA.